This is what Bishop Peter Storey preached in 1986. Challenging apartheid wherever he could, he led the Methodist Church of Southern Africa into what many white congregants saw as uncomfortable ‘political’ territory. Join him in his inspiring journey from sailor-turned-minister to the South African Council of Churches leadership in its darkest hour, from tending to Robert Sobukwe and Nelson Mandela on Robben Island, through the forced removals of District Six and to the storm surrounding Stompie Seipei’s murder. 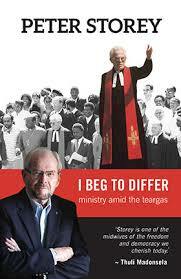 I Beg to Differ spans a humble parish minister’s sorrows and joys, his founding of Life Line SA, the bombing of Khotso House, a close shave with death with Archbishop Desmond Tutu, and the Truth and Reconciliation Commission. In his own words, Storey shares his convictions that inspired him to speak out and minister fearlessly amid the teargas, violence and intimidation of the apartheid regime.